Nice to meet you. 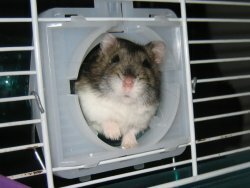 My name is Oscar and I'm a Campbell russian hamster (but I was born here in Japan around one year ago). My Mama and Papa live in Japan, but they're from Australia. They have to go back to they country and can't take me with them. Because of that I'm staying with my new Papa since last Saturday. I have already met Nana and Luna. They're huge! I'm still a bit shy because I haven't got used to my new home yet. The first two days I didn't go out from ny nest much because I was a bit afraid of the new smells around me. Now I'm not afraid anymore and I take food from my new Papa's hand and play with him sometimes. Yesterday night he let me play on top of his bed for a while and he gave me some broccoli. At night I like running very fast in my new wheel. Now I'm going to explore this place a little more. I will tell you what I find! hey oscar, your a very lucky little hamster cos your papa loves all his hamsters. its gr8 to see a new person, keep updated. good luck oscar. Welcome Oscar! I look forward to hearing more from you! Daniel is right, you have a great new Papa and you are lucky (and so are we). Bienvenido, Oscarin! Que guapo eres! We are so happy to see you settling in! Yes, Nana and Luna are HUGE, but beautiful and friendly too! Welcome to your new home, Oscar! You're a very handsome boy. Let us know all about your discoveries ok?! Oscar I am so sorry You lost your first Mama and Papa but how lucky you are to have found a wonderful new Papa! I look forward to seeing all your new adventures! Welcome to the Internet Oscar. 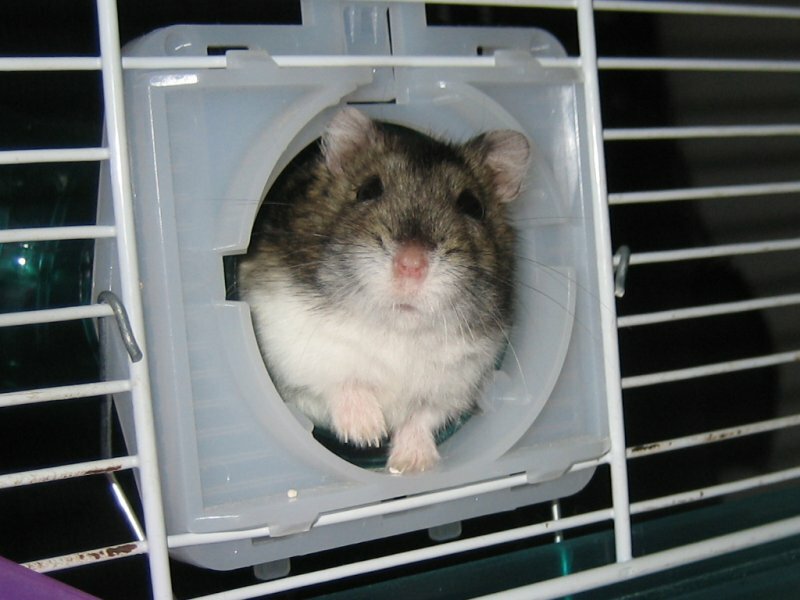 You are very cute; you'll make the top 10 lists of handsome hammies this year! You must be very good natured to let Papa play with you already. Can you come and teach my friend, Pepper, not to be afraid. It's taking her a very long time to get used to being handled. She had a very bad time at the pet shop. She was shy, and they kept grabbing her when she was sleeping. It made her very bad-tempered. She much better now, but maybe you could help? P.S. Maybe Papa will make you a new cage out of a box. Do you think he would make me one and mail it to me? Hello Oscar, welcome to your new home! Wow, Oscar. You must be very excited to have a new and interesting place to live! You even look pretty excited in the picture you have asked your new Papa to post online for you. Your new Papa seems like a really kind and caring person, so don't worry! I'm sure he'll take very good care of you. Plus you will get to make friends with Luna and Nana, too. Don't forget to keep us updated on your new adventures. If you new Papa forgets to help you post new updates, just remind him by biting on the wires of your cage. Luna and Nana will help teach you how to do that. Much love to you all! oscar, if you are good, and not bad-tempered, fruit will come to visit maybe. Welcome to the family, Oscar! I am sorry your original mama and papa had to go away, but now with Papa Javi, you will become famous the world over through this blog. hi^^ oscar your so cute! theres a new mouth to feed in the nest! Oops. I meant maybe your papa would make me one and send it to me. It looks like fun. Hello little Oscar! You look very cute :) You are such a small hamster but I think that you have a big personality. Javi, isn´t it nice to have a boyhamster in your home for a change? So nice to meet you, Oscar! Hello Oscar! Welcome to your new home. I hope you like it. You are a very cute hamster. Hi Oscar!! It's great to meet you. Welcome to your new home Oscar! Hope you'll enjoy your stay there. Hello Oscar!! I go a few days visiting your page i me to been charmed with I congratulate you!! !